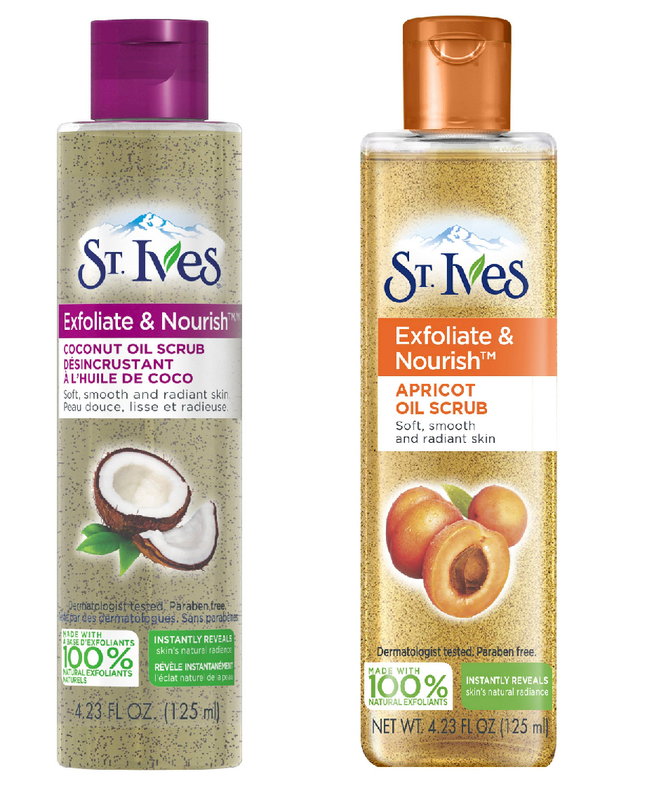 St. Ives just released two new Facial Oil Scrubs ($6.99 at Target) and I'm so curious to try them and see what they're like! This is the first "oil scrub" I've seen, whether high-end or drugstore and I think it's a great idea, especially for someone like me with dry skin. When I was a teenager, I used to use the famous St. Ives Apricot scrub but I stopped once I found out that the walnut shells in it had jagged edges that could scratch your skin. Thankfully, they have addressed that with these new formulas! The coconut shells (in the coconut formula) and walnut shells (in the apricot formula) have been milled into circular spheres so they won't scratch or harm your skin. These new formulas claim to combine the nourishment of a facial oil with the exfoliation of a scrub. They're paraben free, non-comedogenic, and dermatologist tested. Apricot- Vitis Vinifera (Grape) Seed Oil, Sorbeth-30 Tetraoleate, Isopropyl Palmitate, Silica Dimethyl Silylate, Hydrated Silica, Juglans Regia (Walnut) Shell Powder, Phenoxyethanol, Fragrance (Parfum), Prunus Armeniaca (Apricot) Kernel Oil. Coconut-Vitis Vinifera (Grape) Seed Oil, Sorbeth-30 Tetraoleate, Isopropyl Palmitate, Silica Dimethyl Silylate, Hydrated Silica, Phenoxyethanol, Fragrance (Parfum), Cocos Nucifera (Coconut) Shell Powder, Cocos Nucifera (Coconut) Oil. Grab one now at Target.com and Target stores! I'm placing an online order right now and will pick them up in-store later...do you guys ever do that? The checkouts at my local Target have terrible lines so I love being able to just go in and pick it up without having to wait. I just got the coconut one at Target last night! I'll let you know how I like it! I heard they had a class action lawsuit on the original apricot scrub. I never understood how they could say that was dermatologist recommended when my derm always told me not to use it because it had jagged walnut shells that will scratch the heck out of your skin. I'm so glad they are using rounded pieces in these new formulas because I really want to try them! Thanks for the info. I had also heard about the lawsuit, and never used the scrub on my skin after reading that any kind of nut shells can scratch your skin. Hmm, maybe I'll have to try these!